1000's of Products in Stock! 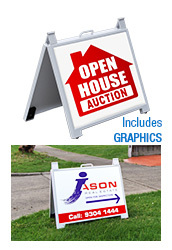 The Real Estate Signs are an Inexpensive Way to Advertise. These Outdoor Signs are Easily Displayed In Front of a Business or in a Yard! 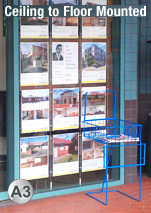 These real estate signs are available in different styles to suit the needs of different businesses. The outdoor signs are a great way to promote upcoming events in a yard or near a sidewalk. 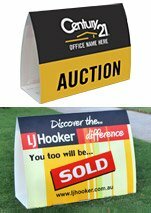 The signage displays, real estate signs are made of recycled fibreglass to be environmentally friendly. This also means they are inexpensively priced and the savings are passed onto customers! The outdoor signs are designed using plastic and fibreglass to help prevent rust when left outdoors, as occurs with some metal stands. Outdoor signs, advertising displays, and other real estate signs, include A-frame style signs are easy to assemble and look great. These displays use your own custom artwork to promote upcoming events or real estate agency numbers on a double-sided display. The real estate signs are securely held together using bungee cords. 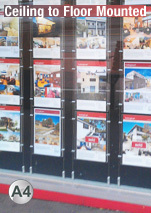 The outdoor signs can hold rigid substrate up to 5mm thick, available at any local sign shop. 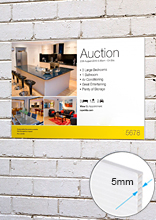 These lightweight outdoor signs hold custom graphics that are 600 mm x 450 mm or 600 mm x 600 mm. 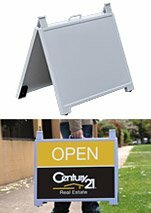 The durable real estate signs are great for agencies, restaurants, bars, and information centres to promote to potential customers. 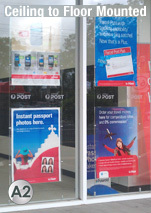 The business signage also includes (2) step frames. The stakes are easily set into the ground using the step built into the base of the frame. Simply place the stakes in desired location, and gently push down using your foot on the step to securely place the unit into the ground. 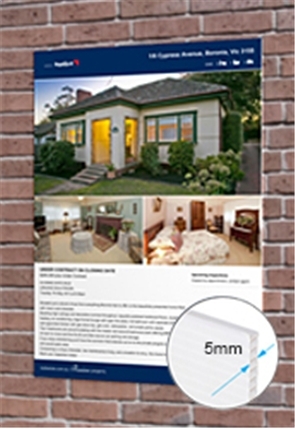 The yard signage, real estate signs hold substrate up to 4 mm thick that is 600 mm wide. The closed display holds graphics that are 450 mm high, while the other step frame has an open design that allows for unique design. A custom design that is cut in odd shapes (such as a house) work great in this sign and really make an eye-catching unit to grab passersby’s attention. Fasteners are not required to be used with your custom advertising signage! The sidewalk sign also includes a single stake advertising display mean to be used with corrugated plastic. These custom boards are extremely inexpensive and cost-effective for any business. The display also features a step for insertion into the ground. Since the custom sign board fits into the middle of your sign board, nearly any design can be used! Use an attention grabbing design such as an arrow to help direct visitors to your location with these inexpensive yard displays. 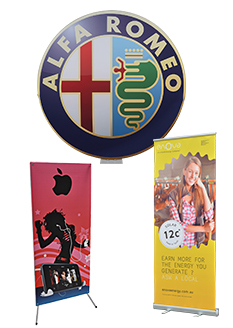 These displays provide an easy way to advertise your business or services to customers. Designed with recycled fibreglass to be environmentally friendly, each holder displays info to passersby easily. 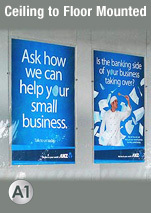 Many other styles of advertising units are available to suit the different needs of individual businesses. Slimline Warehouse is leader in quality displays sold at low prices not found anywhere else. Same day shipping on orders paid for by 1 pm AEST is available with many products. From Melbourne to Perth, Darwin to Brisbane, we ship nationwide to service all customers in Australia! Copyright © Jessen Group Pty. Ltd. All Rights Reserved. Content and images are under copyright ©. It is illegal to copy or use the images without permission.